If you’re interested in nutrition, you can’t have failed to notice the rise of CBD. This 100% natural cannabinoid is a massive hit across the world! Free from adverse side-effects and completely legal, it’s bringing happiness to millions of victims of chronic pain, anxiety and sleep problems. Now, according to a new study, it could deliver even more. A team of researchers recently investigated the anti-proliferative effects of CBD, already demonstrated in previous studies. They concluded that cannabinoids may be able to stem cancer progress by preventing diseased cells from dividing and invading healthy tissue. Other studies have also suggested that cannabinoids may deprive tumours of the blood supply they need to grow, and may stimulate the immune response. “There is still a need for additional anti-cancer substances,” said study author Professor Burkhard Hinz. “ If we summarise all the existing data on cannabinoids, we can see that they act at several levels of cancer progression.” This significant new property adds to CBD’s most remarkable effect - one which is undoubtedly easier to observe: that of providing rapid pain relief. How does CBD relieve chronic pain? 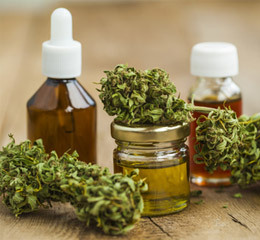 Several studies had previously demonstrated CBD’s ability to make pain more tolerable and less unpleasant but had been unable to explain the precise mechanism involved (1). But as of the end of 2018, the scientific community has been onto something. Dr Gabriella Gobbi and her team have shown that CBD does not act on the cannabinoid receptors called CB1 like THC, but acts instead through a mechanism that binds specific receptors involved in anxiety (serotonin 5-HT1A) and pain (vanilloid TRPV1). How should CBD be taken? CBD is a lipophilic compound, which means it tends to dissolve in fats. Its absorption across the intestinal wall is significantly affected by this characteristic: absorption is increased five-fold if you take it with a high-fat meal rather than on an empty stomach or between meals (2). Fats also stimulate the secretion of bile in the intestines which improves absorption of CBD. It’s worth noting that after ingesting a capsule of CBD 25mg it takes around three hours for blood levels to peak. And the effects can last for 24-48 hours (3)!